**Looking for a Teacher’s Guide? Click here. Josh put his finger on the word and tried to sound it out. By the time he got to the bottom of the page, a headache had started to pound behind his left ear. He snapped the book shut and shoved it across the table. Eleven-year-old Josh’s summer is getting off to a bad start. It’s the first week of vacation, but instead of being out on the water in his nifty sailing dinghy, he’s stuck in the library with the latest in a long string of tutors. Josh is dyslexic—and since he moved out west to live with Dad, a whole new crop of kids have been teasing him about his problems writing and reading. At least Josh loves living at the marina on Dad’s cruising yacht. He’s counting the days until his brother, Matt, still back in Toronto with their mom, comes out to join Josh and his dad for a sailing trip. When a mean classmate, Brittany, bets Josh he can’t beat her in an upcoming boat race, Josh isn’t too worried. With Matt as his racing partner, he’ll stand a good chance. But when the news comes that Matt has to enroll in summer school instead, Josh’s anxiety goes into overdrive. If he loses the race to Brittany, he’ll have to volunteer as a reader at the library—his worst nightmare! It’s time for Josh to prove what he’s made of, and readers will cheer him on as help comes from unexpected quarters. 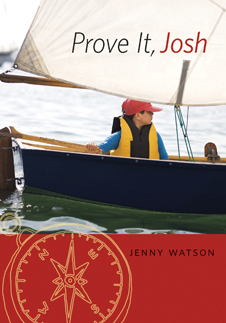 Combining sailing lore, page-turning adventure and gentle humour, first-time novelist Jenny Watson has crafted an engaging, encouraging tale. Josh’s story comes full of inspiration, not just for the learning disabled, but for anyone who has to overcome adversity. It sounds like a wonderful story and you’re right, all kinds of people face difficulties and barriers in their lives. Thanks Pat! I think we all do, and it’s how we deal with the difficulties that defines us.